Can you feel the beat and heat of 2012 Dragon year coming? Pavilion KL launched its ‘Majestic Dragon Festival’ on 6th Jan. Centre Court, Level 2 again was transformed into the ‘Dragon Festival’, a first-of-its-kind themed bazaar with unique dragon arts and craft offerings, rainbow calligraphy, dragon beard candy and a photo portrait dressed in traditional Chinese costume. As you step in Pavilion KL, hanging above the Centre Court is a Magnificent 600-foot long dragon, signifying power, wealth and luck, that sweeps down to welcome shoppers as they enter the mall. Joyce Yap, CEO-Retail of Pavilion KL, launched the Chinese New Year campaign by symbolically awakening the dragon, unleashing its positive energy. Once the dragon was awakened, it joined another dragon to make a Double Dragon dance. 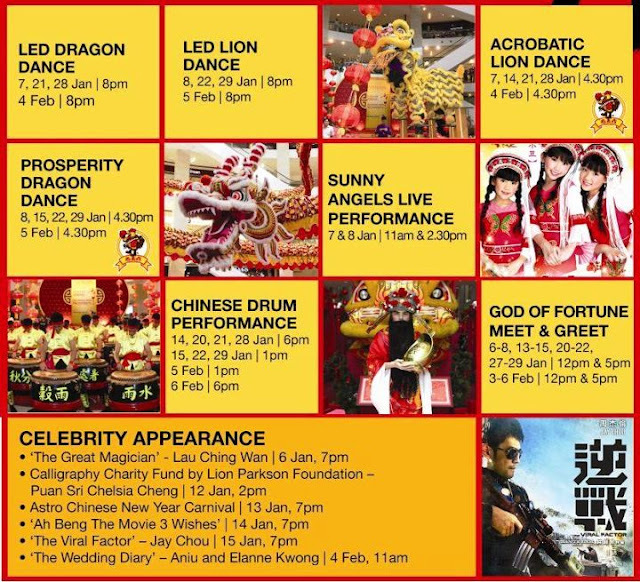 The 2 dragons were joined by the 8 Lion Dance, intensifying the good luck and fortune. “The Dragon is one of the most positive spirits of the Chinese zodiac, signifying power, wealth and luck. 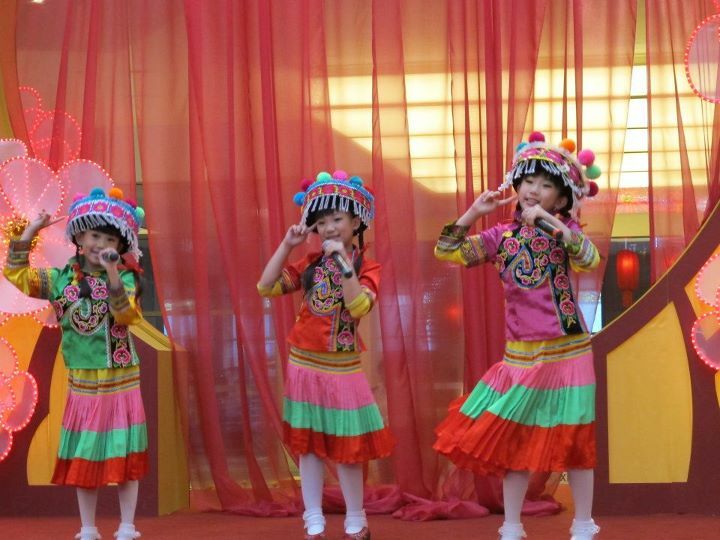 As such, our aim was to create a grand and awe-inspiring experience for this Chinese New Year. And what better way to illustrate this than with the majestic 600-ft long dragon gracefully hanging above us. We are delighted that our larger-than-life dragon has already received a lot of attention as a popular photo hot spot,” said Yap. Spend RM200 in a single receipt at any specialty store and stand a chance to win a limited edition Poh Kong ‘Dragon Abacus’ gold pendant (being held by Kung Suan Ai, Director of Marketing, Pavilion KL- in blue). Campaign partners of the ‘Majestic Dragon Festival’ which comprises of Pavilion KL, Kiew Brothers and Poh Kong. From left to right: Joyce Yap, CEO-Retail of Pavilion KL, Ruby Lee of Poh Kong, Raymond Khue of Kiew Brothers and Kung Suan Ai, Director of Marketing, Pavilion KL. Guests were treated to a festive lou sang which tourist shoppers also enjoyed, thrilled as they were able to experience the local customs of Chinese New Year celebrations. The festive event ended with a remarkable Acrobatic Lion Dance at the Bukit Bintang Entrance where lions twirled, twisted and leapt from platform to platform, giving out mandarin oranges as symbols of ‘gold’ to onlookers. A calligraphist at one of the themed bazaar’s selling rainbow calligraphies at the Centre Court, demonstrating calligraphy to a young onlooker. There are many other stalls set up as part of the themed bazaar which consists of stalls selling dragon beard candy, unique dragon arts and craft offerings and more. Don’t miss your chance to try your hands at the Dragon Pearl vase, which historically bestowed good luck and prosperity in Imperial China. 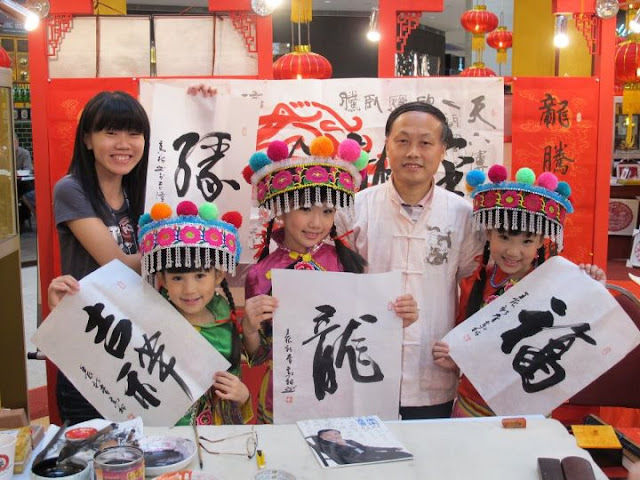 Explore the dragon-themed offerings at Centre Court from dragon beard candy, rainbow calligraphy, silk embroidery, snuff bottle painting, paper cutting and more. Tourists can enjoy a 20% discount and free dragon beard candy at the Dragon Festival when they redeem their complimentary Tourist Reward Card at the Concierge Desk, Level 3. Spend RM300 at any specialty stores or RM100 at Centre Court to redeem a free portrait in Chinese traditional costume exclusively at the Dragon Festival. Spend RM200 in a single receipt at any specialty store for your chance to win a limited edition Poh Kong ‘Dragon Abacus’ gold pendant. This breathtaking necklace entails two dragons facing each other in the form of a figure ‘8’ and jade beads. Double your chances when you spend at Poh Kong. Get your last-minute Chinese New Year shopping done and receive 2-hours free parking bonus with RM300 spend in a single receipt only from 14 to 22 Jan. Spend RM100 at Centre Court or RM200 centre-wide to get a FREE photo in traditional costume Portraits are also available at RM20 per photo. Annual festive charity drive organized by the Lion-Parkson Foundation. Stand a chance to meet your favourite Asian movie stars at Pavilion KL as they promote their upcoming movies that will be showed in Malaysian cinemas this month. 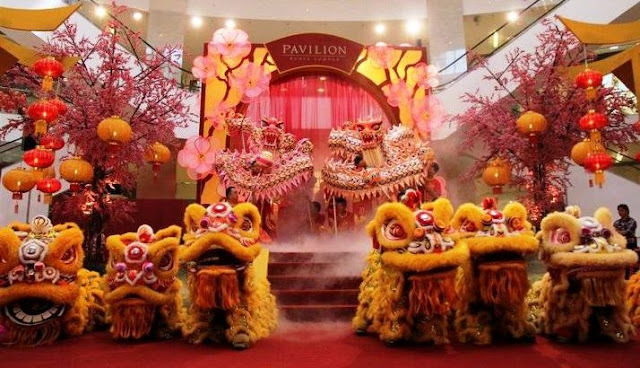 Pavilion KL will remain open throughout this Chinese New Year – 7 days a week, 10am to 10pm nightly. The Connection Precinct remains open until 1am on Sun to Thurs, and until 2am on Fri and Sat.